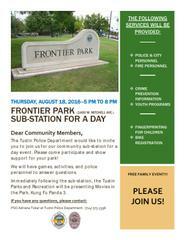 The Tustin Police Department would like to invite you to join us for our community sub-station for a day event. This is a free family event. Please come participate and show support for your park! We will have Police and Fire personnel to answer questions. Immediately following the sub-station, the Tustin Parks and Recreation Department will be presenting Movies in the Park, Kung Fu Panda 3.